Update (13:20 UTC, March 8, 2019): Added comment from Enjin. 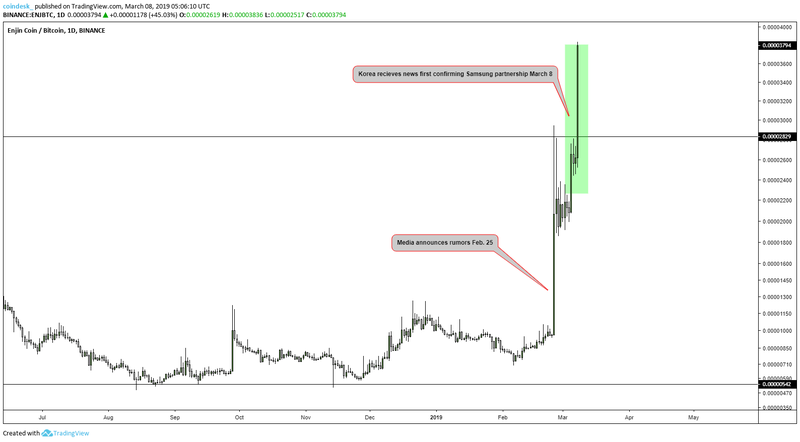 Gaming crypto Enjincoin (ENJ) is up 78 percent after the project said it has an official partnership with Samsung Electronics. On Friday, media outlets in South Korea reported the partnership between Enjin, the Singapore-based company behind ENJ, and Samsung’s flagship smartphone S10, was confirmed, which ignited Korea’s investor base to jump in. In late February, Samsung presented S10 at MWC Barcelona 2019, and showcased the phone’s Blockchain Keystore feature, which will house private keys to cryptocurrency assets – a function that has drawn attention thanks to the flagship product’s predicted reach of 45 million users in 2019. During the showcase of Blockchain Keystore, the company also displayed a picture that included the logo of the Enjin crypto gaming platform. 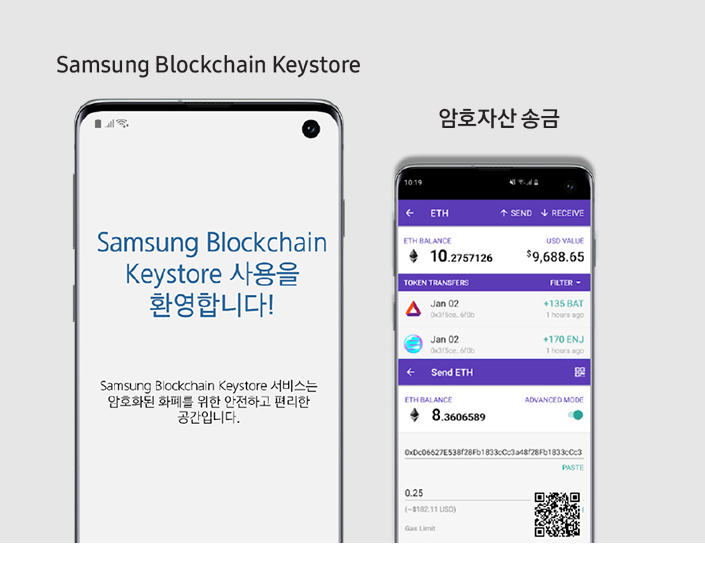 Many have been speculating since then the possibility that the Enjin wallet will be integrated with the Samsung Blockchain Keystore on S10. ENJ is a cryptocurrency for virtual goods, namely in-game items that can be exchanged, traded or swapped cross platform with the potential to create entirely new in-game e-commerce ecosystems utilizing the ERC-1155 token based on the Ethereum blockchain. Rumors began circulating Feb. 25 with this image aligned to the Samsung Blockchain Keystore and a leaked video of the Samsung Mobile Business Development Summit featuring Enjin’s logo. Since then price action has given way to speculation as investors piled on to take advantage of the bullish announcements. That sparked a frenzy of self-perpetuating investor interest as it rose 206 percent before closing out 116 percent up on the previous day. ENJ also experienced another major spike on March 5 after announcing their Blockchain Software Development Kit (SDK) is due to launch on March 14, which helped price close out 27.5 percent higher while March 8 put those gains to shame rising another 76.1 percent over a 24-hour period to where it currently stands. Hong Kong Dollar-pegged stablecoin launches	Question of the Day: Can Stablecoins Accelerate Cryptocurrency Adoption?